The party just heated up. Check out these new products that coordinate with select our 2019 Sale-A-Bration items. Products available while supplies last until March 31, 2019. This means products will only be available until March 31 or while supplies last, whichever comes first. If a product’s supply is depleted before March 31, it will be made unorderable and will no longer be available for purchase. 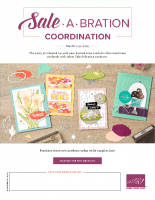 Participate in our Exclusive Sale-a-bration Product Coordination Card Swap. May I please pre-order the follow 3/1 releases?